I wrote earlier this week about a local [MA only] deal where you could get the 2013 Belle Glos Meiomi Pinot Noir for $15.95/btl. That's a great deal for a reliably delicious California Pinot Noir that Wine Spectator rated 92 points. I bought 6 bottles, cracked one open tonight and thought it was spot on. But today I'll share how you can get this for less than $15 a bottle which is almost unheard of for a wine of this quality, and you don't necessarily have to live in Massachusetts. 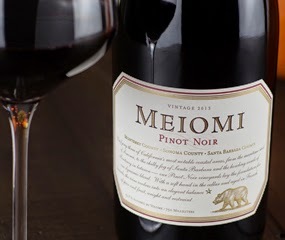 First off, if you're not familiar with Meiomi, it's the entry level Pinot Noir from the Wagner Family. This is the same family behind the famous Caymus Cabernet Sauvignon that's probably the most reliably 90+ point rated Napa Cab of the past couple decades. The Wagner family is known for crafting wines of high quality that drink well on release with plush opoulence. A few weeks ago I wrote how you could get $30 off $100 from Wine.com with code AMEXSPRING. For a while there, a bonanza presented itself because the code was triggered $30 off on orders of any size. That enabled a lot of free wine orders until Wine.com plugged the gap. Now orders must strictly be $100.00+ for the code to work. Shopping portals a great way to stack savings on top of savings. Wine.com's prices and availabilty vary by state. Here in MA, Meiomi is $19.99. So I'd add 4 bottles of Meiomi. Plus one wine for just over $20 to make the total just over $100. Use the Advanced Search function to find wines $20-$25. Then sort on price, low to high to find a bottle just over $20. This will give you free shipping on your order. Be sure to cancel it once your first order has arrived. Here's a post that describes some of the finer details on how to do this again and again. In MA, Meiomi is $19.99 a bottle. It would actually be nice if it were $20 a bottle, because then we could get 5 bottles for exactly $100 and be done with it. But as it is, if you order 5 bottles you fall just short of $100 (to trigger the $30 off) and if you order 6 you've got too much overshoot. So get 4 bottles of Meiomi at $19.99 and then throw in, say, a $22 bottle. Then our total is $102 for 6 bottles of ~$20 wine. With $30 off $100 that takes us down to $72 for 5 bottles. With no sales tax (in MA anyway) and free shipping that's $72 for 5 bottles. That's $14.40 a bottle. And that doesn't include the 5+% cashback you got through a portal which could take this down $13.68 a bottle. My goodness, what a deal. This of course can be applied to any order of $100 or more. The key is knowing which wines are favorably priced vs. retail. Some wines they carry are quite price inflated. But Meiomi isn't. I opened a bottle tonight and it is fantastic. Highly recommended. PS While I was poking around Meiomi's website I spotted a new collection of brands called Copper & Cane. It includes Meiomi plus an Oregon Pinot Noir called Elouan, a Napa red called Carne Humana, and a Zinfandel called Beran. I'd love to taste Joe Wagner's take on Oregon Pinot Noir. I'll have to look into this.